As you may not from previous posts, I love vintage knives, of all kinds. 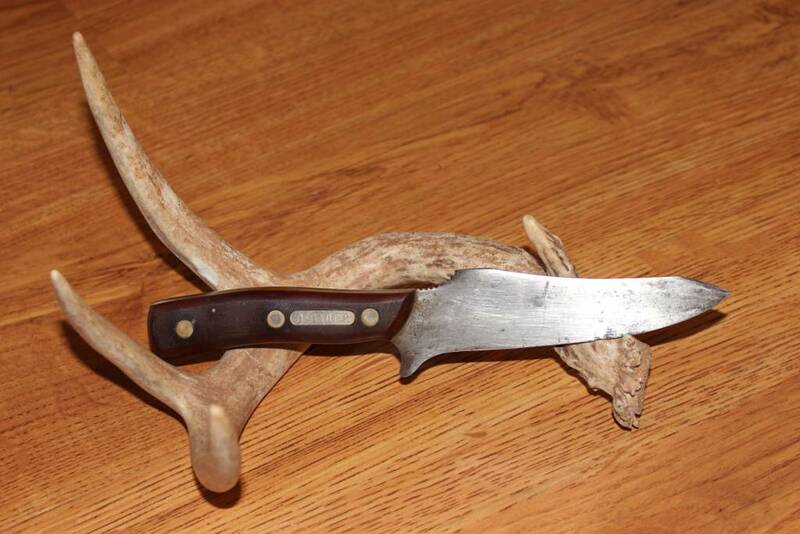 My father picked up a Schrade Old Timer 150T “Deerslayer” the other day at an auction. It’s definitely seen some use, and misuse as well. The sheath is pretty rough and looks like something has been chewing on it. The knife itself is in decent shape, but the blade does have some discoloring. But it has a great edge to it. I thought it was a rather strange shape for the blade as the top 3/4 inch of the blade has an edge much like current tactical or fighting knives do. Doing some research, that isn’t how these knives were made. So that has been added. Most likely, the tip was broken and that was the fix decided upon. 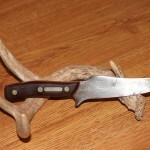 I’m wondering how this might make for a hunting/skinning knife? That tip mod might come in handy when field dressing a deer. It might. Or it just might get in the way. Guess we’ll have to wait and see. The knife has a good feel and a nice heft. It’s certainly sturdy enough to handle dressing a deer. I like the finger guard on the bottom and the thumb placement indention on the top of blade. The only concern there is the thumb indention is serrated, so that could be bothersome with long use. I would love to know the story behind this knife, who used it and what for. That’s the real interesting part of collecting old knives and guns, the history behind it and the owner. This entry was posted on July 8, 2012, 1:03 pm and is filed under gear, hunting. You can follow any responses to this entry through RSS 2.0. Both comments and pings are currently closed. The knife is an excellent hunting knife. I have used it for many years on deer hunts. The carbon steel blade sharpens very easily and has a very good edge. The shape makes for quick and easy field dressing of the deer or elk, and its size is not a discomfort to carry all day long. It also makes easy work of quartering larger game when needed. Thanks Jeff. One thing I’ll need to do is get a better sheath for it. The original one is pretty tore up.